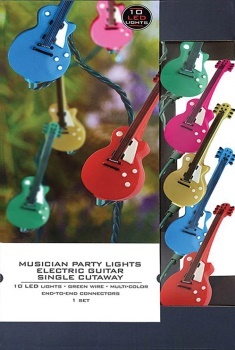 Make any space a fun party atmosphere with these remarkably life-like guitar lights. Featuring an iconic electric guitar shape, each strand has 10 LED multi-colored lights and is 12 feet in length on a standard green wire. The lights are UL Certified with a standard holiday light bulb and end-to-end connectors.